Our customer was using an automatic guided vehicle (AGV) that didn't have any powered conveyor. They needed a machine that could move 500 pound, 30- by 60-inch pallets from the AGV to an operator workstation. Tuff Automation custom-designed the conveyor pictured above to solve the problem. The machine we designed does a lot in a small amount of space. Our engineers and parts fabricators had to be efficient and precise in their work. Furthermore, the finished product needed to withstand heavy-duty part handling 24/7. 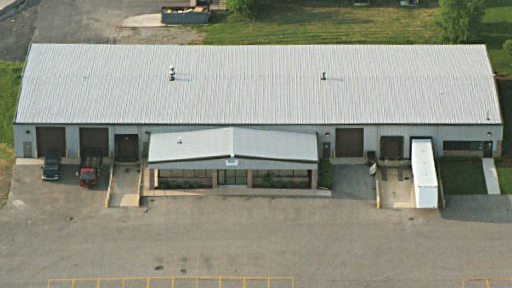 Tuff Automation is uniquely equipped to handle these requirements. Six-strand chain transfer with lift and extend mechanism - This transfer handles three pallets at a time and uses an electric drive and pneumatic lift. 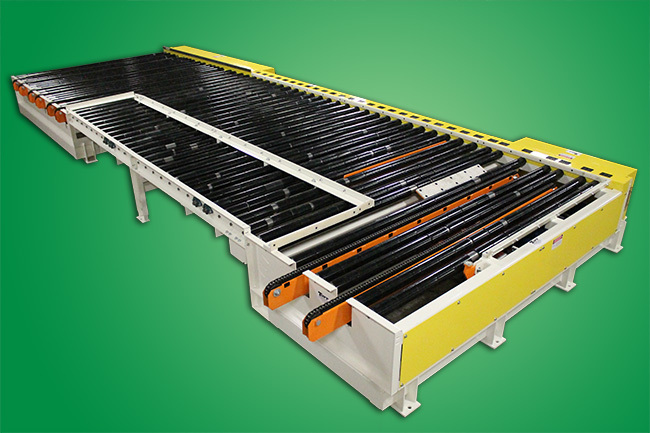 The extender reaches into the AGV, lifts three pallets simultaneously, and conveys them into the conveyor line. CDLR conveyor with accumulation - Pneumatic blade stops accumulate and meter pallets. The rollers are covered with Ultrex sleeves to handle accumulating pallets. Tip-up/positioning mechanism - This part of the line pneumatically tilts 25 degrees at the operator unload station. A pneumatic clamping mechanism positions the pallet at a 25 degree tilt, and secures it for operator unload. Two-strand chain transfer with lift and extend mechanism - This extender picks a single empty pallet off the conveyor line and extends to deliver it into the AGV. Our lead times are highly competitive, and we use only materials of the highest quality. If you have questions about how Tuff Automation can customize a product for you, contact us. Want to stay up to date on the latest projects at Tuff? Sign up for our email newsletter.